Today was the first Sunday of the month, January 6, 2019. Also the first Sunday of the new year! We met at the Cottage Irish Pub in the Eau Gallie section of Melbourne. We went over a few things for the club, talked about how to submit your photo and blurb for the member bios page, delivered another blue polo shirt to a new member and shared some EV news. Most importantly we all got to meet the our newest member with their brand new Tesla Model 3. We have an upcoming event on January 24 for our local Sierra Club chapter in Rockledge. 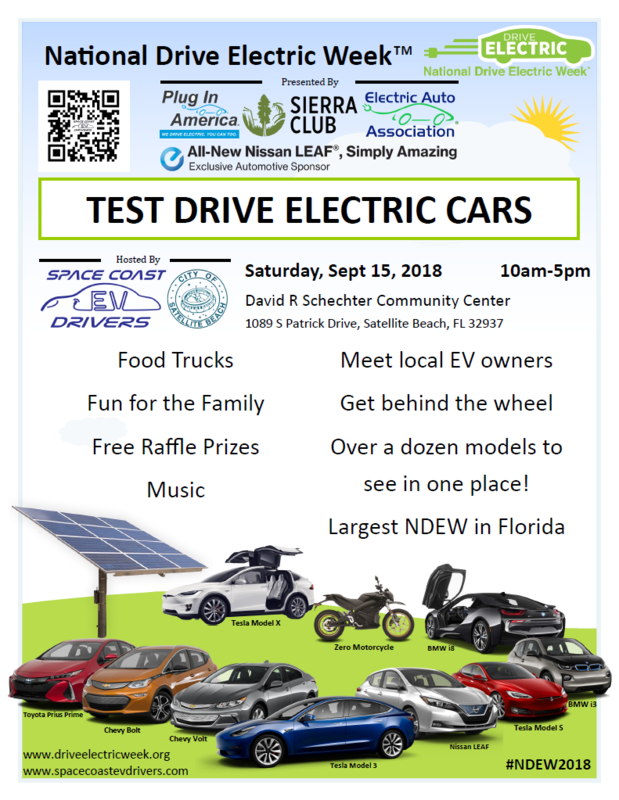 We’ll bring as many different makes and models as possible to show everyone all the differences and what to look for when shopping for an EV. We’ll also give a presentation about the club and how we’ve grown to over 100 members and over 100 electric vehicles. Don’t forget you can always go to our upcoming events page to see when our next public event is scheduled. We agreed our February meetup would be at the Fiesta Azteca next to the Medical City in Suntree. We only had two vehicles this time compared to the eight we had last year. It was a 2018 Nissan Leaf with the 150 mile range and a Chevy Bolt with 238 mile range. As always we had a great time answering all of the questions everyone had as they walked by to get to the petting zoo and pony rides set up just behind us. There were well over 1000 or 2000 attendees so we must have talked to more than 200 people about the benefits of driving electric. If we can help at least one person think better about or even consider an electric car for their next vehicle that is a big win. We explained how the cost of batteries has come down 85% in the past 8 years so it won’t be very long until electric vehicles will cost as much or even less than gasoline cars. We also explained how to find used EVs to get into a daily electric car without spending very much money. For the first Sunday of July we decided to meet at the old Moon Hut, now La Fiesta in Cape Canaveral. Since the city has decided to install FREE to use charging stations at City Hall, the Public Library, and Manatee Park, we wanted to take some photos to show them just how much extra business they are bringing into town. This is one of the main ideas every business and apartment/condo owner needs to know. If you install charging stations you will attract more customers. These customers will also end up spending more money at your business/restaurant because they will wait around a little longer than others to wait for their car to charge. This means they might buy an extra coffee or get dessert where other customers would have normally left already. Then, once your competitors are also installing charging stations then you can install FREE to use stations to attract more customers than your competitors. Even if a car was plugged in for 4 hours it would only use about $2 of electricity. So by giving away that $2 you would get back much more than that in extra business. This is way better than the money you would spend for advertising and marketing and get even better results! Once you put your charger on plugshare.com EV drivers will find you and single you out over your competitors – especially if planning a trip and need to stay at your hotel. They will always pick one with a place to charge while they sleep. For more information about charging stations check our info page here. The other big thing to talk about was to get started on advertising and getting the word out on National Drive Electric Week! Don’t forget to sign up to attend and tell everyone you know to sign up to attend as well. We have almost 100 EVs in our club so it would be awesome if we could break 80 cars this year. Go to our official event page to sign up today! Here’s a link to the full photo album showing all the different EVs we had that day.